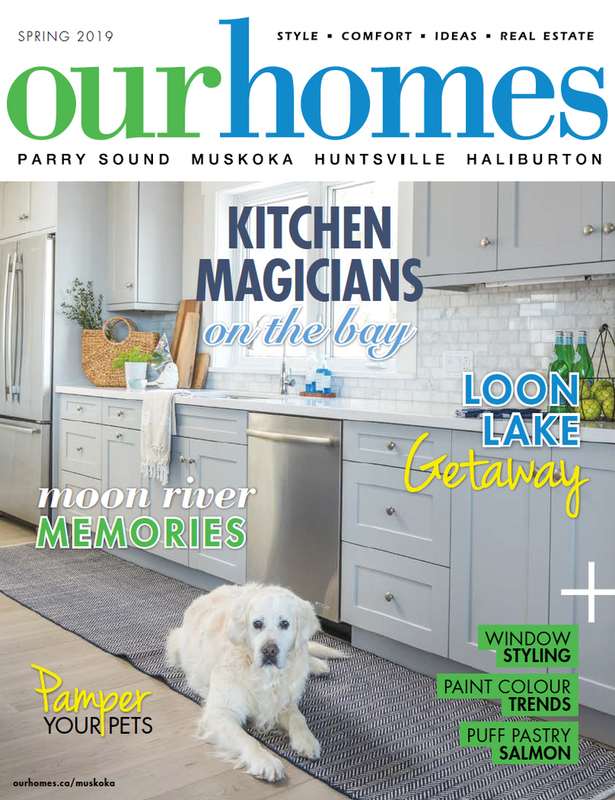 A version of this article originally appeared in the Spring 2019 issue of OUR HOMES Parry Sound Muskoka Huntsville Haliburton, p.36. 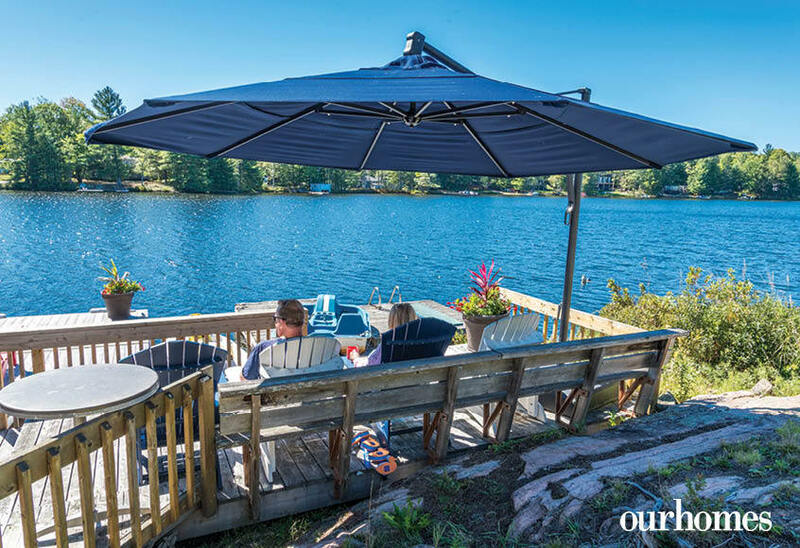 Find local businesses in our Muskoka directory. 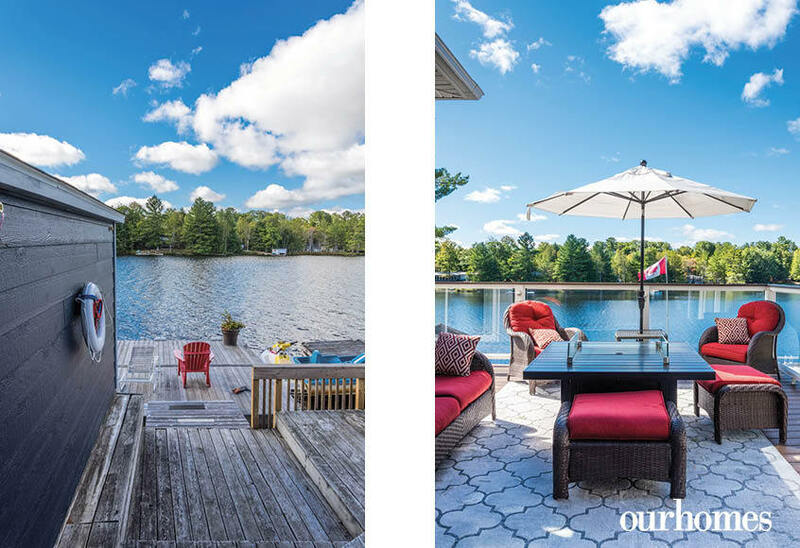 The thought of using their own ideas to build a lake house in Muskoka appealed to Susan and Stephen. That’s why they chose Royal Homes to construct their nine-bedroom vacation home. Royal’s design and sales specialist Selena McConnell expertly guided them through the process. 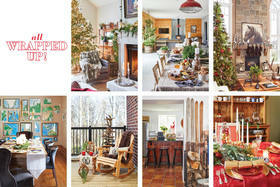 The entire family provided inspiration for the overall flow and design of the home, says Selena. 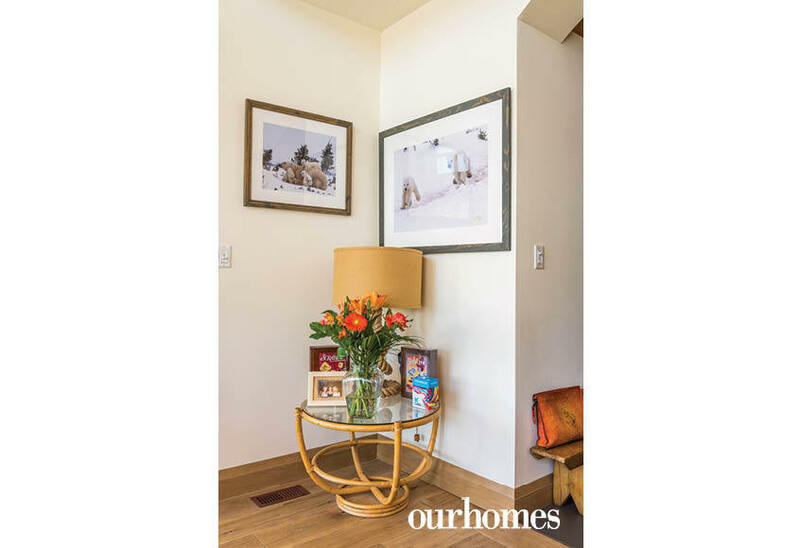 “There are multiple generations that use the family cottage and the design allows for them to all be under one roof,” she says. 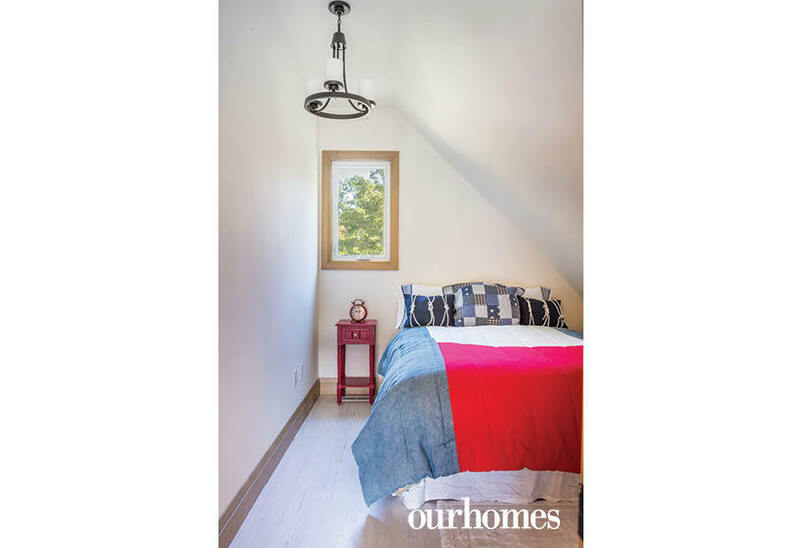 The upper floor of the cottage, a three-bedroom loft, is their youngest daughter’s area, a space where she can host friends and someday her own family. The ground floor, with four bedrooms and a walkout to the front yard and lake, is for another daughter who has three sons. Stephen and Susan’s master bedroom is on the main floor, where the kitchen, great room and dining room is a gathering place for the entire family. “We all come to the main floor for breakfast, lunch, dinner and barbecues,” says Susan. 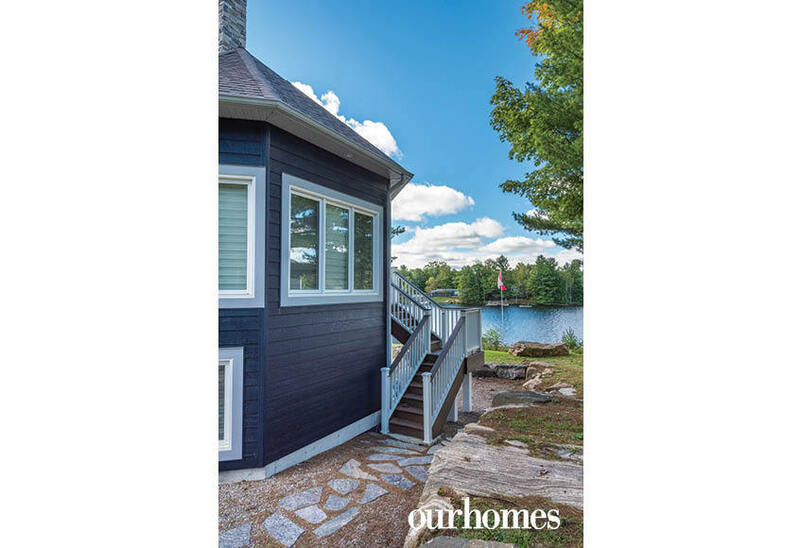 With 5,400 square feet of living space on three levels, their lake house is embedded in colourful, folded bands of granite on Loon Lake, a narrow waterbody, four kilometres long, carved out of the Canadian Shield by glaciers thousands of years ago. The lake house is just minutes from town. Its dark blue exterior siding is trimmed in grey and white. The steep roof and matching dormers create a Cape Cod look. 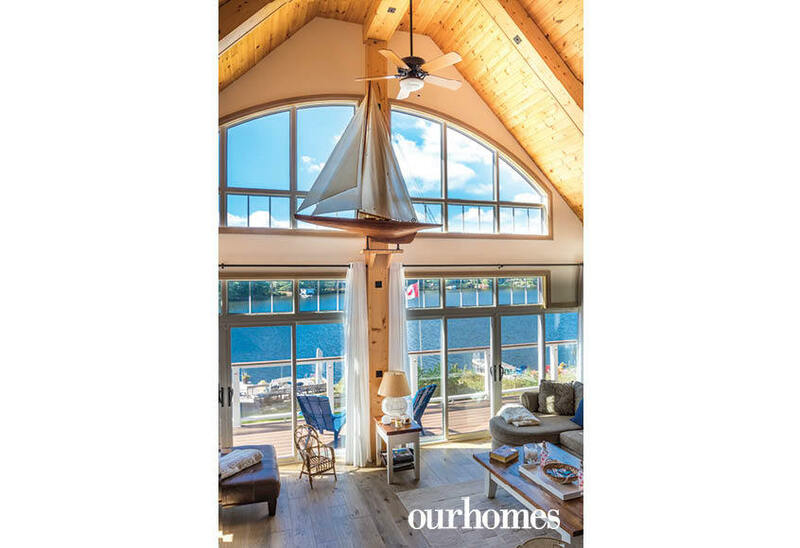 The great room's high, vaulted pine ceiling frames a wall of windows overlooking the lake. 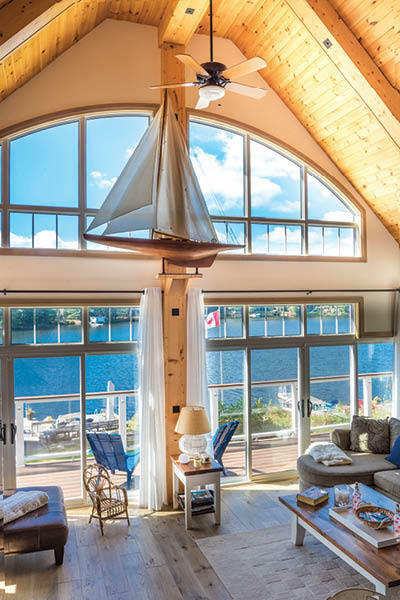 Mounted high in the centre of the wall of windows is a large replica of a wooden sailing ship, a gift from Royal Homes. It complements the nautical motif, evoked throughout the cottage with rope lamps, navy pillows and tiny white anchors. At one end of the great room, a wood-burning Napoleon fireplace enhances the warm ambience. 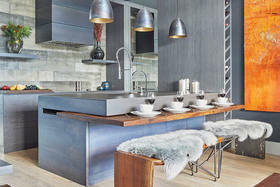 Family and friends gather in the sleek modern kitchen. 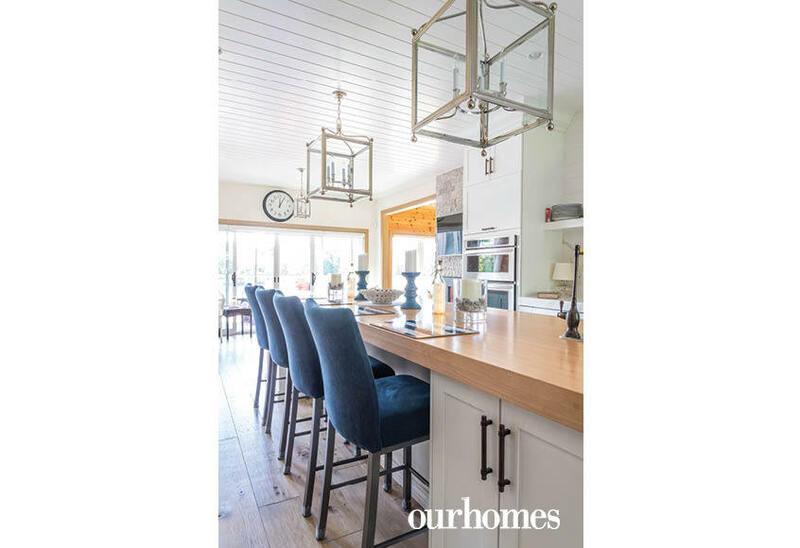 A maple butcher block tops the long kitchen island, with a wine cooler on one end, lots of drawers and storage space on one side, and a dining bar with stools on the other. Suspended from the ceiling, large, silver-framed lanterns illuminate the space. A two-sided, propane fireplace separates the kitchen from the dining room, built in an octagonal shape and finished with pine walls and ceiling. At the other end of the main floor is the master bedroom with sliding glass doors that open to the exterior deck and a beautiful lake view. In the en suite, basketweave marble covers the floor. A crystal chandelier hangs over the French tub on one side of the bathroom and a glass-walled shower stall occupies the opposite space. White ceramic tiles with an undulating finish cover the walls. The upland side of the home belies its stately lakeside appearance. Granite blasted to make way for the foundation was used to make footpaths. 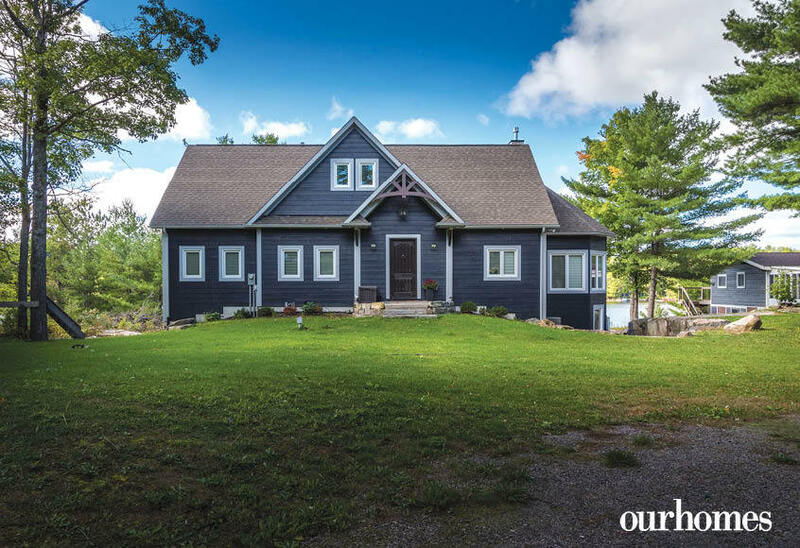 The Cape Cod-style cottage by Royal Homes sits on the shore of Loon Lake, where folded bands of granite intersect the front lawn. A gas-fired table-top fireplace is surrounded by cushioned, woven furniture on the outdoor deck that spans the the front of the cottage. Granite blasted to make way for the foundation was used to make footpaths. Shaded from the sun, the dock deck is a great place to watch the lake. 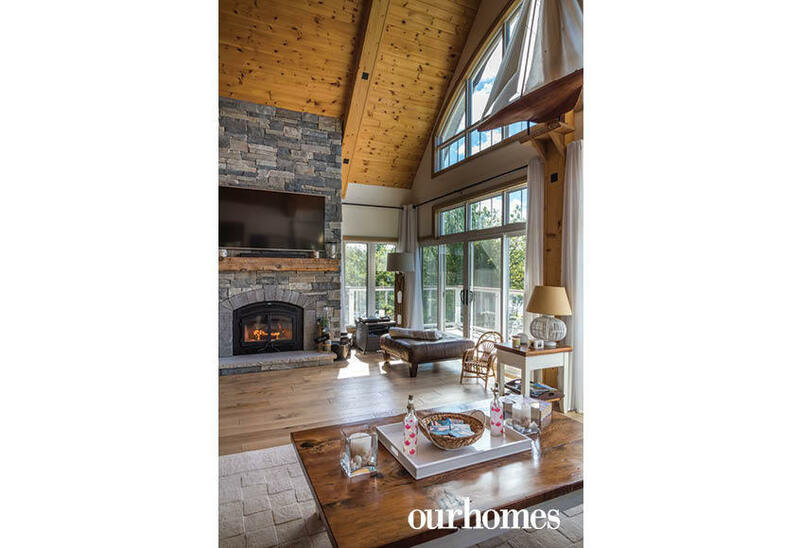 A wood-burning fireplace warms the great room with its soaring ceilings. A glass-topped rattan table adds to the mix of wooden furnishings. 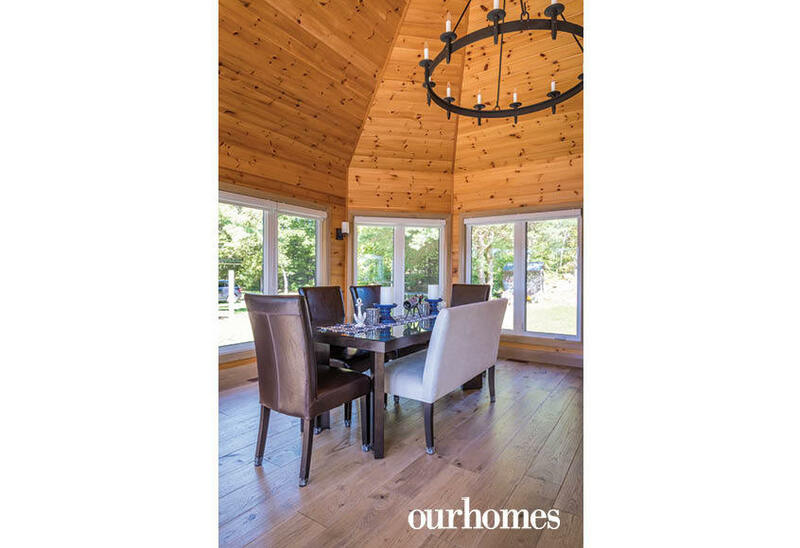 An octagonal shape to the cottage dining room gives diners a panoramic view. 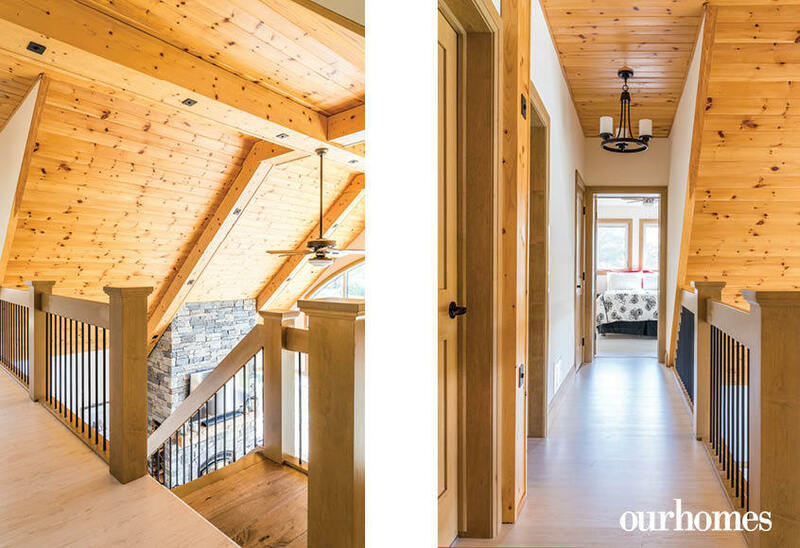 The pine-clad ceiling gives it a Muskoka-room feeling. 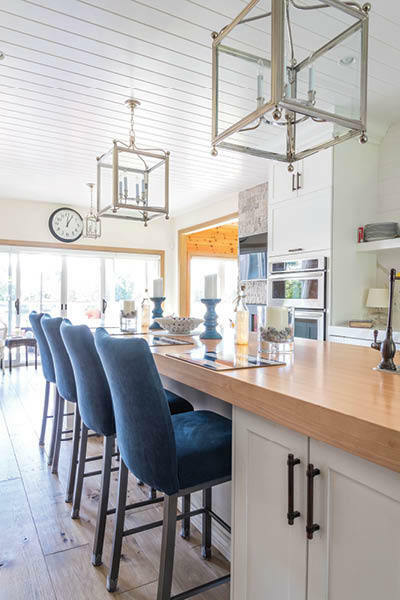 Blue cushioned stools align with the kitchen island. 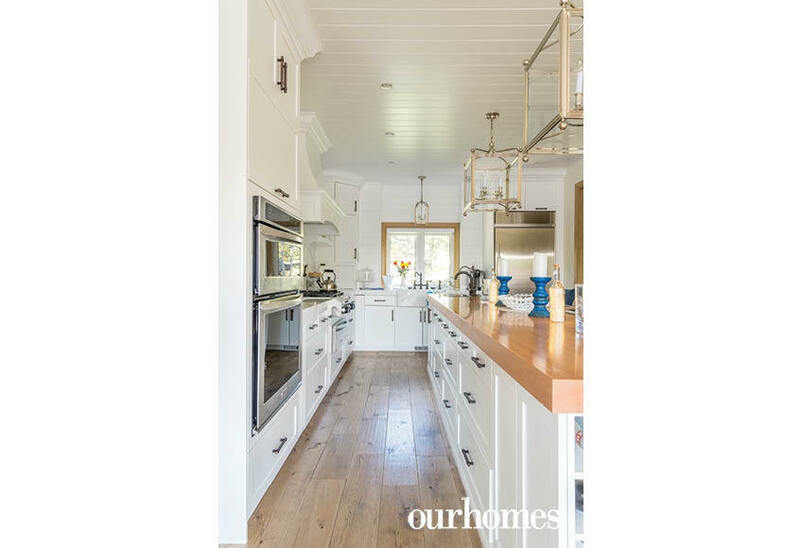 Hardwood floors are hand-scraped hickory while the butcher-block island top is made of maple. 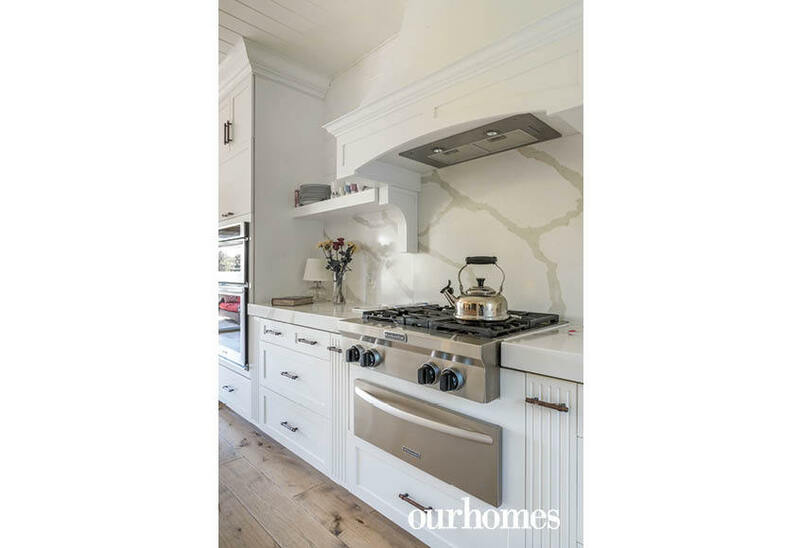 Diamastone quartz forms the backsplash and countertops flanking the stainless-steel kitchen range. Knotty pine clads the soaring ceiling over the main living area. A catwalk with a view of the great room connects the upstairs bedrooms. Nautical-themed pillows and a duvet in red, white and blue express this family's love of sailing. 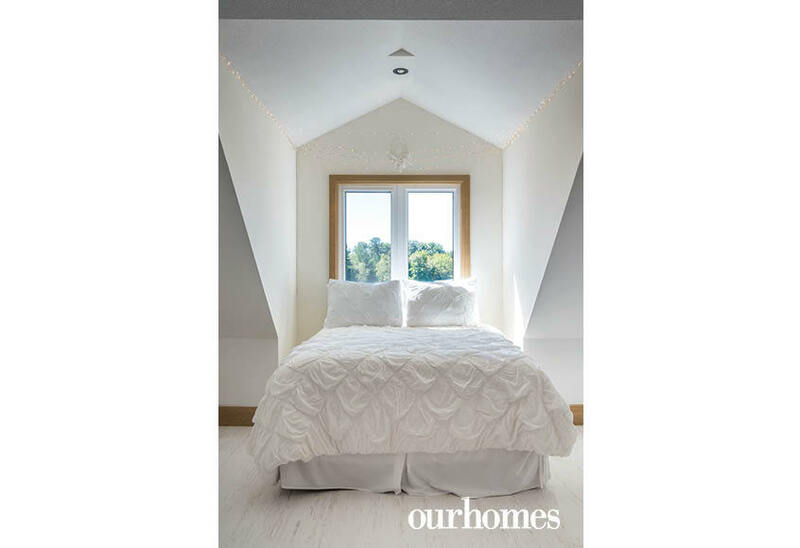 Snuggled in a second-floor dormer, this all-white sleeping space is one of nine bedrooms in the spacious cottage. Roomy closets flank the hall separating the main-floor living spaces from the master bedroom suite. 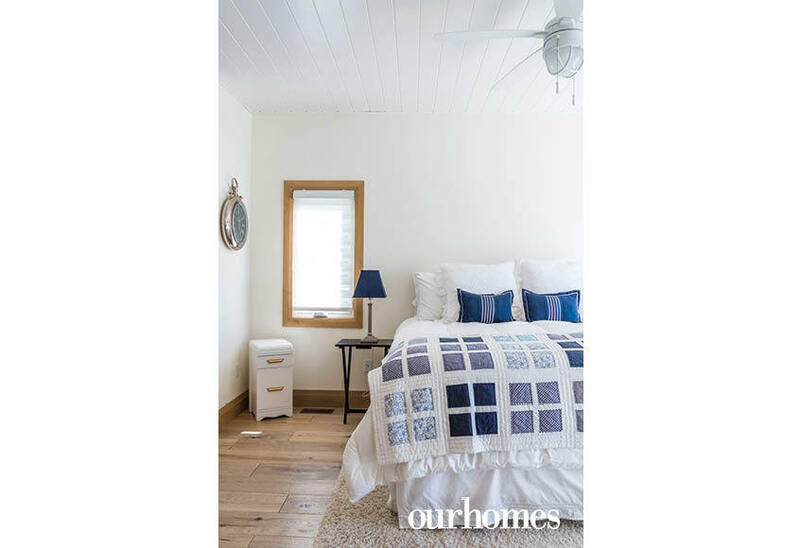 The main-floor master bedroom has a cosy rug underfoot with crisp white and navy bedding. 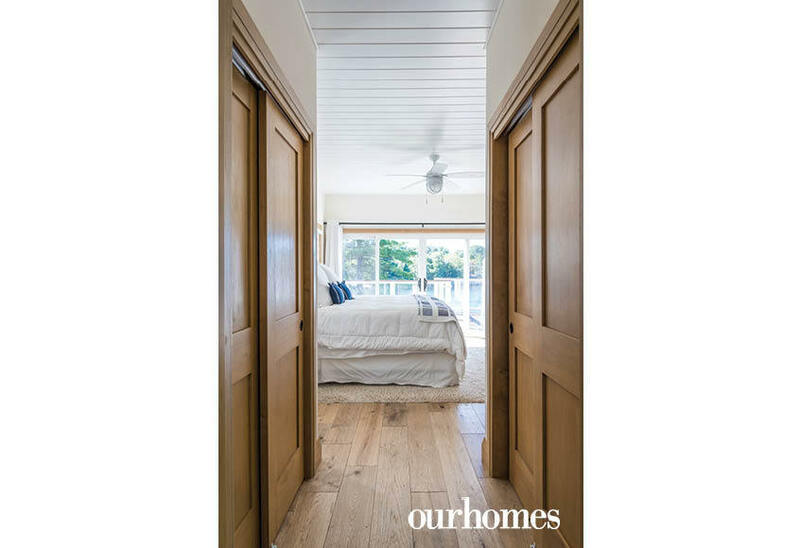 Tongue-and-groove boards on the ceiling are fresh, with pine trim on the windows and baseboards. A floor of basketweave tiles supports the freestanding tub in the en suite. The tiles intersect the wall of the glass-fronted shower.